These majestic cabinets are unique, not only for their unusual height and large proportions, but also for the vigorous grain pattern of the huanghuali on the front door panels, resembling mountainous landscapes in Song dynasty paintings. 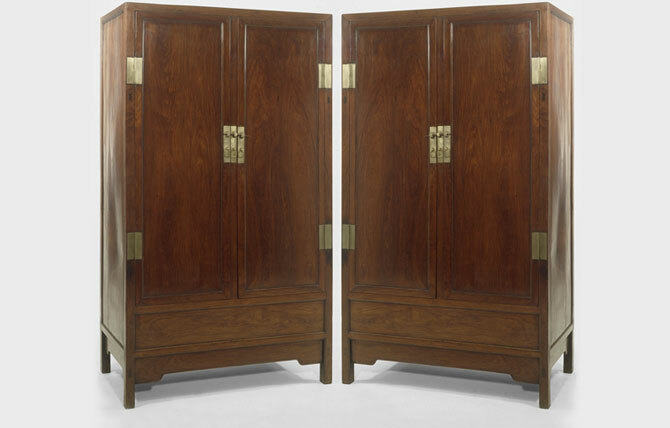 By selecting these long, plush planks for the door panel construction, the cabinet-maker has achieved a stunning, yet pleasing, visual effect without the necessity of relief carving - revealing the artisan’s tendency throughout Chinese history for making the best use of the intrinsic beauty of his materials in perfecting and completing his overall design. 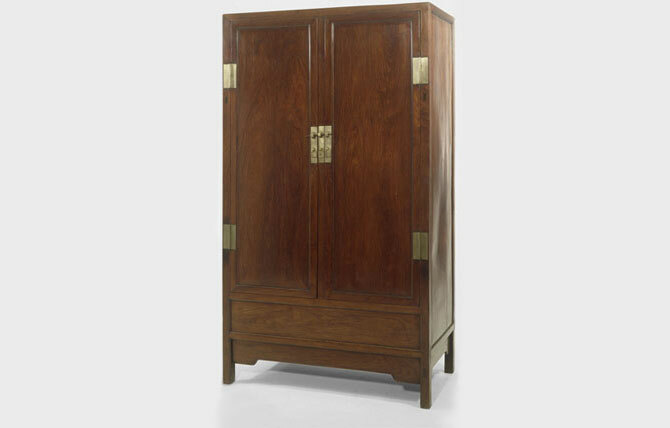 The purity of Ming hardwood furniture is reflected in these cabinets: their structure and shape, their lustre and polish, and the simplicity and design of their hardware. It is rare to find square-corner cabinets of such style and height, especially when they are a matching pair. A square-corner cabinet (Height 75.5 in./192 cm.) with rounded, concave frame members and cusped lower aprons is illustrated in Wang Shixiang’s Classic Chinese Furniture, Plate 147. Another square-corner cabinet (Height 78 in./198 cm.) with scrolled apron carving (but no horizontal lower panel) is illustrated by Gustav Ecke, Chinese Domestic Furniture, Plate 131/Piece 104.